Right now you’re rolling your eyes and expecting us to pull the tin foil hats out. I get that. We have it pretty good in America. The stark truth is still out there- evident throughout history: the government isn’t always on your side. Almost 80 years ago, Anne Frank was penning a diary hiding from the government. Complacency and disbelief of potential dangers is not the way to preparedness. Does this mean I think we all should pack it up and disappear off grid right now? Of course not! But that doesn’t mean that a well prepped individual or family shouldn’t know how to evade the government if circumstances call for it. It is not as hard as you may think, despite the government’s size and reach. Foreign Occupation: In the very unlikely event that America becomes occupied by a foreign force, it may be in your best interest to stay hidden. Religious Persecution: No religion, creed, or belief group has been exempt from persecution through human history. While some are more likely than other based on historic events, it is possible even where it is not probable. Genocide: Ethnic backgrounds and other reasons have been used for sweeping murders before. Unfortunately, on a long enough timeline, they will happen again. Pandemic: Quarantine is one way the government would respond to isolated outbreaks. If you are not infected but in a quarantine area, you have just become an ‘acceptable loss’ in the grand scheme of things. 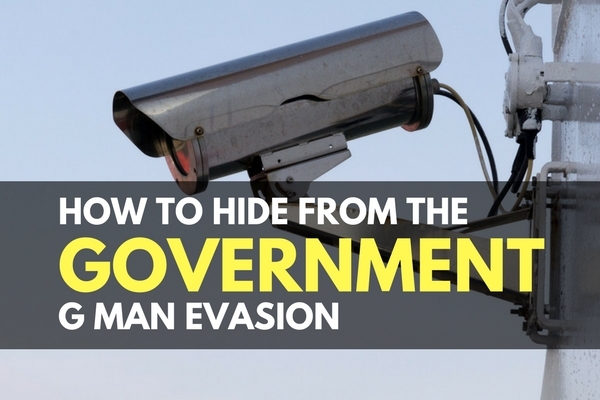 Hiding from others and the government would be the best course of action if the threat is unknown and untreatable. I could go on and on with these- pulling from history and how we know any government would respond to certain threats. While the government is most certainly not the diabolical force tin hat preppers would have you believe, knowing how situations and threats develop can help you see how even the most even-keeled institutions can become dangerous. They know who you are. It’s not just the local DMV, the IRS, and your voting precinct- your social security ‘fingerprint’ is everywhere. The NSA is not a secret entity- they are a hulking entity that collects your information. This fact was well known even prior to the Edward Snowden leaks. Digital fingerprints are the data of choice these days, with online activity monitored and specialized keyword flagging. The tools at the NSAs disposal is mind boggling, and many companies are complicit in the data acquisition. The PRISM program allows many of the top online companies to share data with the NSA, including most email providers. They can systematically categorize, flag, and track your movement and online activity through purchases, IP addresses, social accounts, and even satellite data. Given you are probably reading this online and not printed out, they could know that you came to TruePrepper if they have an interest in monitoring you. During SHTF, the situation changes. Troops on the ground would likely become the main source of information. The virtual hunt would transform into a physical hunt. The collected data could inform a plan if it is the current government, or even an occupational force- but it takes troops to carry tasks out. You do not want to find yourself with a task force at your door with your name in a file. Trending toward a greater risk of war and foreign occupation? Part of a religious group that is seen as favorable or unfavorable by the existing government? In a high density urban center where curfew, accountability, and quarantine could be likely in the event of a pandemic? Think of as many situations as you can as to why the government may want to meddle in your affairs if SHTF or even with everyday escalation. Earmark these risks for later as we discuss further ways to avoid the government. It is nearly impossible to go unnoticed to the NSA if they are looking to track your whereabouts and activity. Sure, you can deal in cloaked IPs, proxies, and try to remain connected; but there are tools to circumvent these and find you still. The best practice is to not be of interest to them. If that is not possible, then you will need to just monitor the government as they monitor you. Keeping up to date on news, and specifically trends, can help you determine how threats are forming and evolving. A wide variety of news sources is best, so you don’t develop ‘news blind spots’. International developments and domestic tension can all spur government action quickly, but not as quickly as you could react to them. The downside to the government’s size and reach is communication flow. Unless it is specifically planned to be instantaneous (ie: nuclear retaliation), most decisions must be run through a ‘chain of command’ which causes their implementation to span from days to even months. Even once a plan of action is determined, disseminating this information to all affected branches and entities takes valuable time. By this point, any seasoned prepper could be far off grid and out of governmental reach. To get off grid, you’ll need to bug out. Off grid life is one of the oldest ways to not just escape the government, but any local or regional threat as well. Unplugging from the power grid and your communication networks can make you very difficult to locate, especially if you do not have paperwork or other ‘breadcrumbs’ leading to your position. Concealment from flyovers, satellite imagery, and possibly would-be scouts are about the only consideration left once you have made it to an off-grid bug out location (BOL). Obviously, you will need all the components necessary to live off grid for an extended period of time, so supply caches are needed. One option that you can always keep in your arsenal is the ability to hide in plain sight. 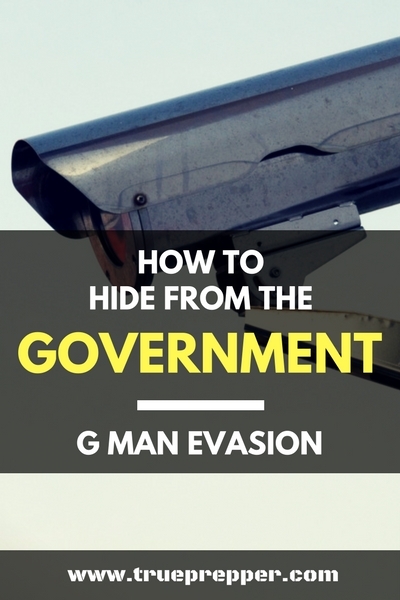 We often talk about the Gray Man Concept and how it can help you draw less attention to yourself leading up to and during SHTF. You can also use this concept to blend in during day to day activities to avoid being noticed or targeted. If you are part of a persecuted group- look like you are not part of that group. If you are experiencing a foreign occupation- become a foreigner. Blend in so you can slip through the cracks unnoticed. After absorbing this information, you may be tempted to call us tin hat preppers. We’ll counter that thought by reiterating that we are moderate and practical preppers. Assuming that a situation is impossible has burned many in the past. Although the events we considered today are unlikely- they are possible and that means they could be worth planning for. Many things are improbable, but not much is truly impossible. Keep exploring, stay prepared, and be safe.